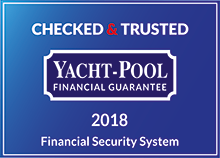 Yachts aren’t blown along – they are ‘sucked along’. 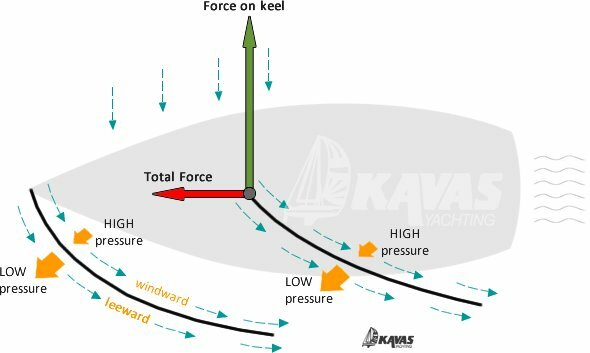 The sail creates a low pressure zone in front of the sail and a high pressure zone behind the sail. The boat moves into the low pressure zone and is sucked forward. This is very like the idea of an aeroplane wing, which is curved in a similar way to a sailboat’s sail as you can see below. 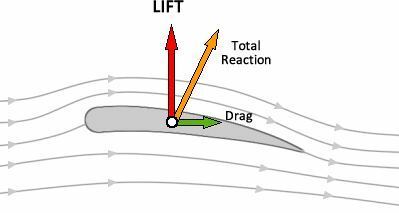 In airplane wings, the pressure on the top of the wing is less than the pressure on the bottom of the wing, because the air moves faster on the top, so this difference in pressure creates a force on the wing that lifts the wing up into the air. The curve on the sail makes the air travel a longer distance over the top of the wing and a shorter distance behind it. The longer distance the air flows, the lower the pressure, and this is why the aircraft climbs into the sky. 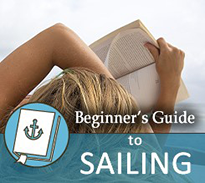 Below the level of the water on the boat, the sailboat’s shape helps force the boat to go straight forward as opposed to in the direction of the wind. In addition you have the keel that is shaped like a wing, and has a lot of weight to stop the yacht from falling over when pushed sideways by the wind. 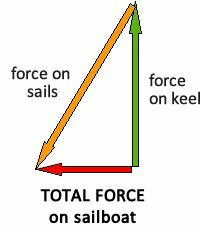 With the sails being unable to push the boat sideways or onto its side, the sails drive the boat forward.